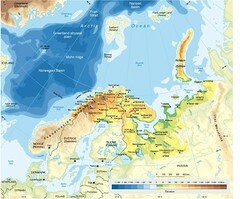 The Barents region is in the Arctic and covers the area of Western Russia and the northern areas of Finland, Sweden and Norway. The Barents Sea has an average depth 230 m, bordered by the shelf edge towards the Norwegian Sea in the west, the island of Svalbard (Norway) in the northwest, and the islands of Franz Josef Land and Novaya Zemlya (Russia) in the northeast and east. (Please note that the The Barents Euro-Arctic Council has expanded the membership since 1998).